The manual ball bonder can be used for wirebonding chips to a package. 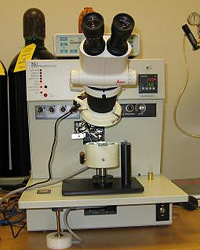 The bonder is capable of handling gold and aluminum wire. You must be checked out before using this tool by yourself.